My family includes a third grader, a first grader, and a kindergartener, and kids that age traditionally exchange Valentines. Usually, they are those little cards with characters on them, but we like to make something more fun and original. When my oldest was in kindergarten, we made leis I found online. We spent several hours constructing them from yarn, die cut hearts, and one-inch lengths of coffee stir straws. Now that there are 3 children in the family, such elaborate projects are not practical, but I still wanted to do something special that the children would enjoy. My main objective is to stay away from candy. Kids these days get way too much candy as it is, and I don’t want to add to the problem by giving it out to their classmates. (I’m sure their parents would appreciate that as well.) Another objective is to avoid giving out small trinkets that aren’t all that useful and often end up on the floor, followed by the trash. So, we went with pencils, the perfect junk and candy alternative! Kids are always in need of more this time of year, and I hate that teachers end up spending their own money on school supplies, so it seemed like the perfect choice! We bought a large box of pencils on Amazon, plus a box of eraser caps for the teachers. 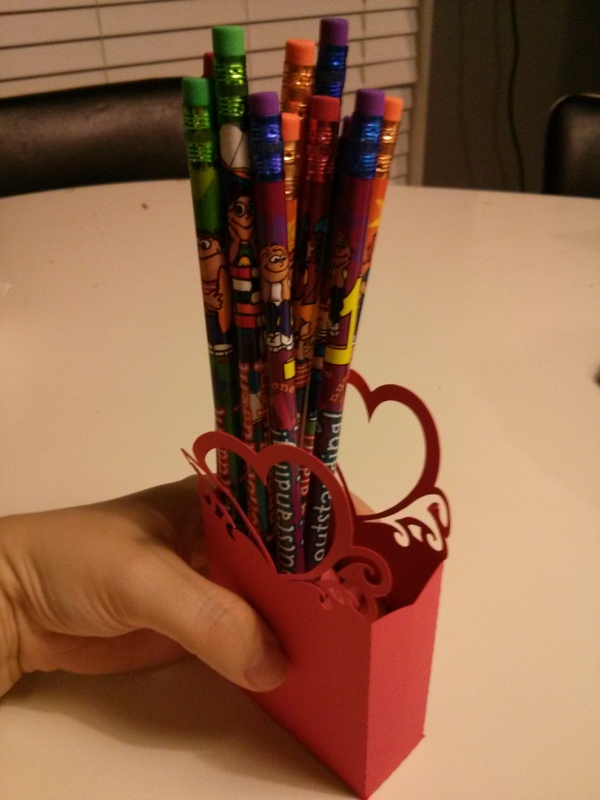 You don’t necessarily need to buy Valentine’s Day themed pencils. In fact, the embellishment we added is enough. For the embellishment, I used my Silhouette Cameo to cut several heart-shaped pencil toppers (available in their online store here). 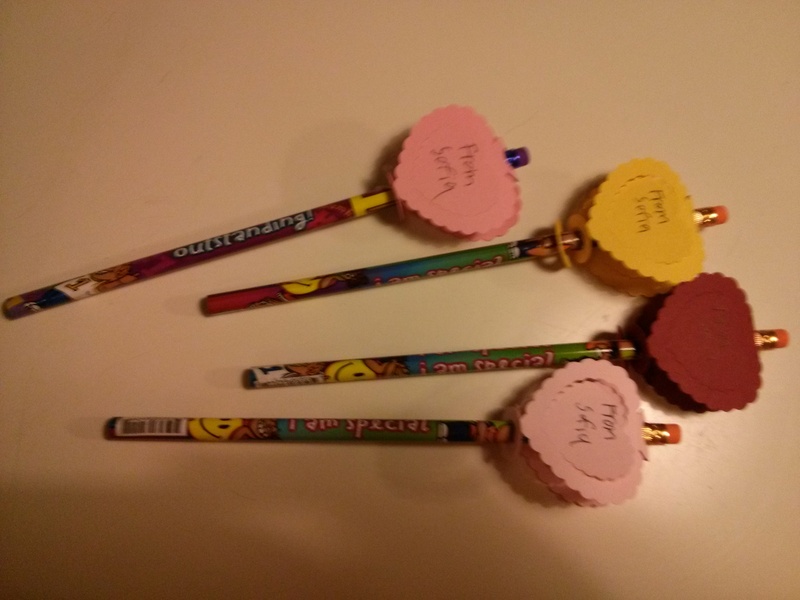 I had each child write “From [name]” on the hearts, then they put them on the pencils. My daughter found that bending the upper circle in half helped it stay on the metal part of the pencil better. If that doesn’t help, you can always add a small piece of tape to hold it in place. We wanted to include a gift for the teachers as well. I cut a small card stock bag with a heart design that came with my Silhouette (here is another design that would also work). Then we filled each one with a handful of pencils and eraser caps. This is, in my opinion, a great teacher gift because it is useful and ultimately saves them from buying supplies for their class with their own money. That’s what our children’s classmates and teachers will be receiving this year. What are your plans this year?